They do not interfere with the door lower track. 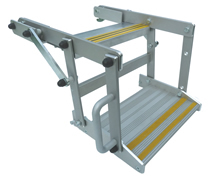 When mounted in a standard vehicle step well, they increase the step well depth by a further 75mm. This can save on expensive body/floor alterations. They do not require any support from the outer sill surface of the vehicle. They are extremely easy and quick to mount on a vehicle. 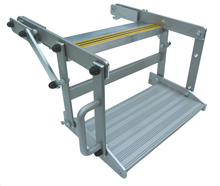 Virtually all constructed of anodized aluminum, with nylon bearings in the pivot joints, these steps are light and easy to use. They have the advantage of internal stowage and therefore do not affect the ground clearance of the vehicle or suffer from exposure to the elements encountered under the vehicle. They can be deployed in an emergency from inside the vehicle with a kick. 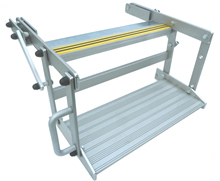 Each step comes with a pair of 8mm thick steel floor mounting plates and 6mm backing plates which are securely bolted to the vehicle floor or step well platform. There are alternative mounting plates which pick up on the step well back wall for applications where it is not possible to bolt through the step well floor. 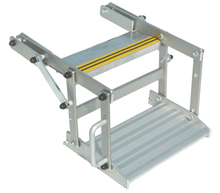 They are easily installed into a vehicle and the step unit can be quickly detached from the mounting plates for servicing or cleaning.